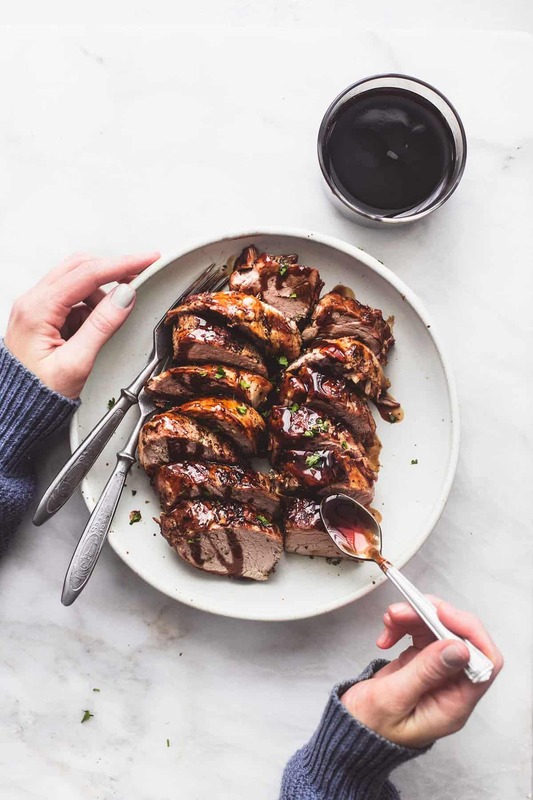 Hands down the BEST, ultra tender pork tenderloin with a balsamic glaze made right in the pressure cooker. 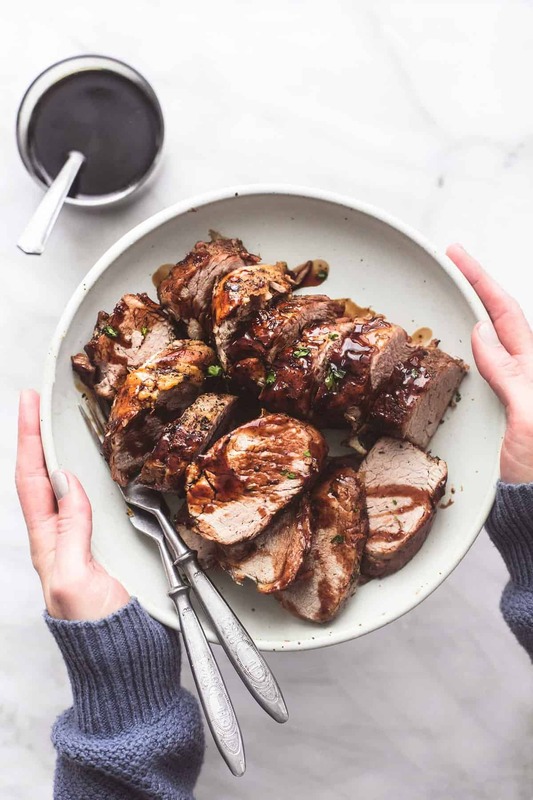 This Instant Pot Balsamic Pork Tenderloin will melt in your mouth and leave you craving more. If you love instant pot recipes, you’ve gotta try Instant Pot Shredded Chicken Tacos, Instant Pot Parmesan Chicken and Rice with Mushrooms, and Instant Pot Honey Teriyaki Chicken. We all have that one recipe. You know the one that you got from a family member, who got it from a family member who got it from the back of a flour sack in the depression but who altered it to work with ingredients that she had on hand and who passed it along to her kids who tried to make it more like the original recipe but who actually knows what that even is anymore? Well, this is that sort of recipe. Except I may have exaggerated slightly. This one doesn’t have that dramatic of a story but it was passed around and altered a bit before it got to me, and here I am altering it even further to make it work in a more modern kitchen appliance — the Instant Pot. 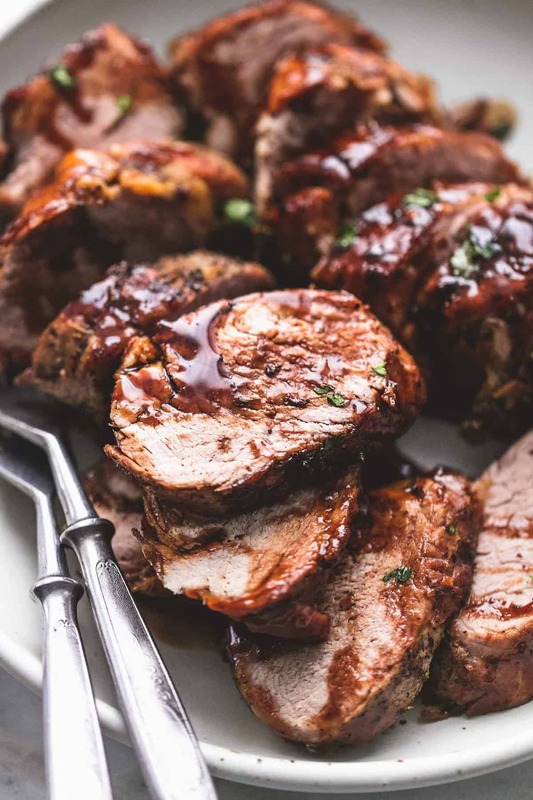 This Balsamic Pork Tenderloin recipe initially came from my aunt, who passed it along to my mother, who made it quite often when I was growing up. 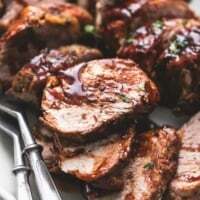 It is a recipe for a baked pork tenderloin covered in balsamic glaze. I’m not sure how my mom tweaked it exactly but I know that she did — she always had just the perfect spin to put on any recipe. While I’ve made this recipe plenty of times as instructed, I always wondered how it would work in the Instant Pot. After all, I’ve used this fast-cooking method for many other versions of pork and chicken, and I figured it would be a cinch to adapt around our fast-moving lifestyle. I love being able to eat the classic recipes I grew up eating but I also love cutting the cooking time. 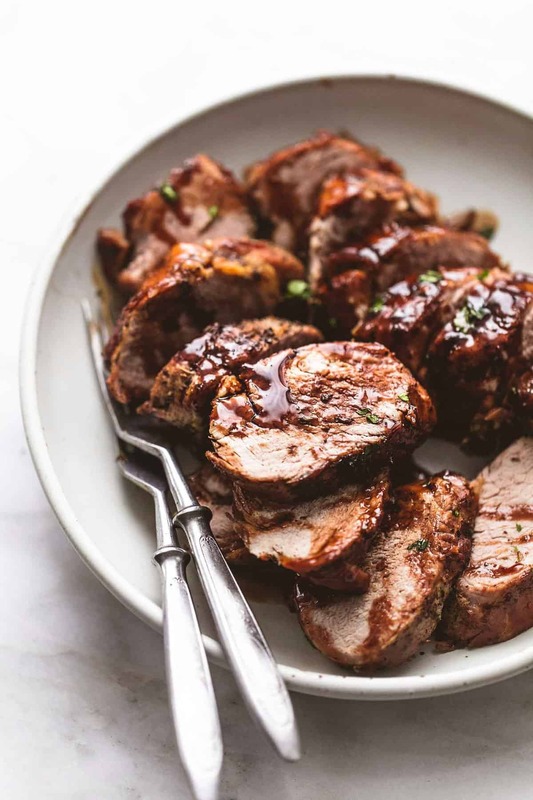 HOW DO YOU MAKE THIS BALSAMIC PORK TENDERLOIN IN THE OVEN? As I mentioned, this pork recipe originally was made to be baked in the oven. If you would prefer to make it that way, simply bake the oiled and seasoned tenderloin at 375 degrees for 35-40 minutes. You’ll make the glaze in a saucepan on the stove while the meat cooks. You’ll want to adjust the water added to the vinegar to ⅔ a cup instead of 1 cup. I also think that the pork tenderloin benefits from a good sear on the stove before being baked in the oven but that’s totally optional. Searing it before baking seals in the flavors of the pork and gives it that nice “crust” on the outside. To save on dish washing, use an oven-safe pan to sear the pork (like cast iron or enamelware) that you can take from stove to oven. WHAT IS THE DIFFERENCE BETWEEN A PORK LOIN AND PORK TENDERLOIN? Although at first glance, these two cuts of meat might seem interchangeable, they are not. A pork tenderloin is thinner and smaller and a loin is very big and wide and steak-like — the loin is where pork chops are cut from. You also cook these two pieces of meat differently. (And they’re not interchangeable.) 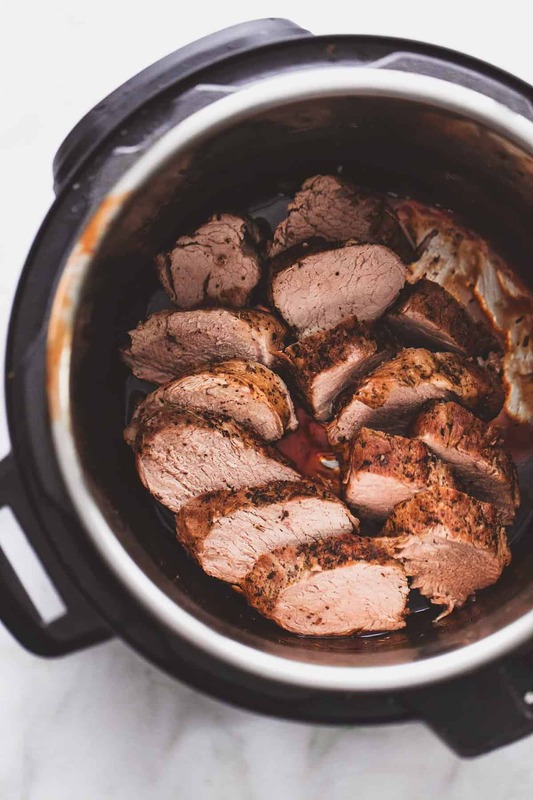 A pork tenderloin is great for marinades and slow cooking. A pork loin is great on the grill or cooked on the stove but can be easily overcooked. Either way, you want to make sure that your pork is cooked thoroughly before you eat it. If you’re not sure if it’s done, use a meat thermometer. It should read 145 degrees at its thickest point to be considered cooked through. IS PORK TENDERLOIN GOOD FOR YOU? WHAT SIDES GO WELL WITH THIS BALSAMIC PORK TENDERLOIN? If you’re looking for an easy side you can throw together with ingredients you probably already have on hand, then it doesn’t get any simpler than this Best Simple Tossed Green Salad. The six-ingredient dressing that goes on top of this salad also goes great with any mixture of salad greens and veggies. I like to serve this pork over the top of wide egg noodles, spaghetti, fettuccini, or any pasta you have on had. It also goes great over white or brown rice. Roasted vegetables such as these Crispy Parmesan Green Beans, Roasted Lemon Garlic Broccoli & Cauliflower, or Lemon Parmesan Roasted Asparagus. Nothing says spring or summer potlucks like this Best Ever Creamy Sweet Macaroni Salad — which just happens to pair perfectly with this pork loin. I also like to make this Baked Parmesan Creamed Corn on the side of a lot of different meats, but for some reason it just tastes the best with a pork tenderloin. Set pressure cooker to SAUTE. Rub tenderloins all over with oil. Season generously on all sides with salt and pepper to taste, then dried herbs and garlic powder. Use tongs to place tenderloins in the pot, turning over every 1-2 minutes until browned on all sides. Whisk together soy sauce, brown sugar, balsamic vinegar, and water and add to the pot. Put the lid on in the locked position with the steam valve closed. Set to PRESSURE COOK or MANUAL for 25 minutes. When cook time is up, allow to natural release for five minutes, then turn the steam valve to the venting position and remove lid once float valve drops down. Use tongs to transfer pork loin to a cutting board and set aside. Switch pressure cooker to SOUP setting. Once boiling, stir corn starch into the 4 tablespoons cold water until dissolved, then pour into instant pot and stir until thickened to a glaze. Slice tenderloins, then serve with balsamic glaze on top. Extra glaze can be stored in a jar in the fridge up to 2 weeks. One large or two small-medium pork tenderloins (1 - 1 1/2 pounds each) work perfectly. You can also do one small-medium tenderloin but will have extra balsamic glaze leftover - you can keep it in a jar in the fridge for up to 2 weeks and reheat in the microwave or on the stove. In place of the dried herb blend you can substitute 1 teaspoon dried thyme + 1 teaspoon dried basil + 1/4 teaspoon dried rosemary. Do you have a suggestion on what to sub out soy sauce for? This looks so yummy, but my household cannot have soy… Allergy! Quite a few readers have had great success subbing soy sauce with coconut aminos! I always had these tips reversed in my mind, good to know! balsamic, that’s what’s been missing with my slow cooked pork recipes, they’ve been really dry lately and balsamic is the right kind of anti-dry additive! thank you! Awesome!! You are going to love the addition, Sabrina!